The Pelco Indoor Medium Size High Security Enclosure with Tamper Switch is intended for applications which require utmost protection from vandalism, like parking garages, classrooms, elevators, etc. 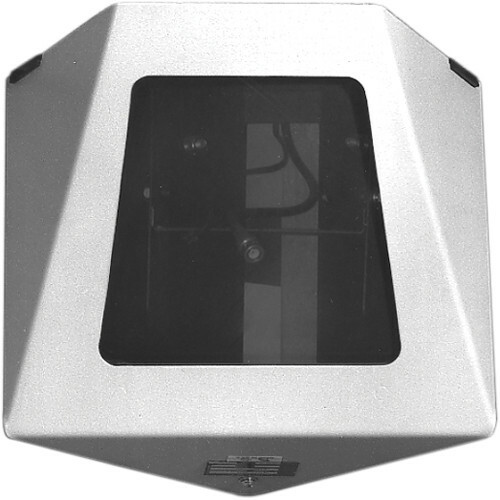 The Enclosure is designed for installation in the corner of a ceiling. An optional hood (HS1500H) is offered with the High Security Enclosure for getting it mounted on the wall without any compromise to the security. In addition to its heavy gauge steel construction, this unit incorporates a Lexan viewing window, resistant to impact and scratching. The mounting hardware which secures the High Security enclosure to its mounting surface remains concealed. The enclosure can be opened only after removing the tamper-resistant screw from the bottom using a specially designed tool (included). This prevents handling of the Enclosure by unauthorized personnel. Another major feature of this enclosure is its built-in tamper switch that incorporates a "pull-to-cheat" mechanism connected to an 125VAC, N.O./N.C. switch contact. When connected to an alarm or other external device, this tamper switch will alert an operator to a possible camera tampering. Box Dimensions (LxWxH) 11.5 x 11.5 x 11.5"